I wrote previously about my five favorite YouTubers (and a ton of honorable mentions), and among those five was Mark Brown. 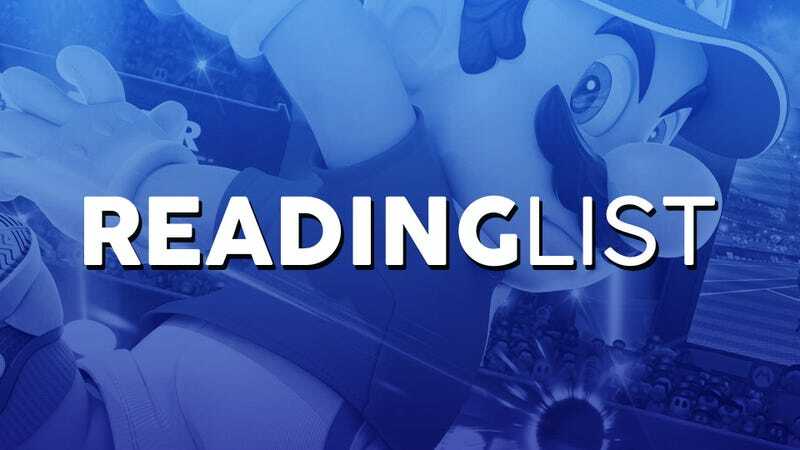 And while I could rhapsodize about how awesome all of his videos are, I instead want to pay attention to another service he provides to his patrons: The reading list. At the lowest payment tier of $1 per month on Patreon, you get access to the “Game Maker’s Toolkit” Discord, a monthly newsletter about the channel, and the aforementioned reading list. I’m happy to help out such an awesome creator, but this reading list really convinced me to become a patron. It should be noted that $3 per month gets you an extra video with suggestions for lesser known games, and $5 per month lets you watch all videos 24 hours early and get your name in the credits, but I don’t have enough cash to spend that much each and every month. Sometime during each month, there’s a reading list with links to a bunch of suggested articles and videos. Yes, I could go out of my way to find these articles for myself for free, but having such a diverse selection all in one place, all with Mark’s seal of approval, has changed the way I read online. I know that whatever is on that list is going to be good, and they’re often from websites, journalists, and channels that I hadn’t even heard about before, on topics that I might not have been familiar with. So what kinds of articles are shown? Well, it changes somewhat from month to month, but there are always a few sections with articles and videos, mostly about video games, that fall into a similar category. It’s then noted whether the link is to an article or a video, the article/ video’s title, and a short sentence or two on what it’s about. For June, there were 32 articles and videos that fell under seven categories: top pick, creation, criticism, culture, classics, other media, and everything else. Length ranges from two minutes to an hour and a half, and everywhere in between. And while there are articles from the usual suspects such as Kotaku and Polygon, there are also harder to find ones from YouTubers with 12k subs and developers’ personal blogs. I read interviews with the four developers of Minit and how they worked hard to create a healthy work environment, and how one of the developers had previously worked on Horizon Zero Dawn! There was a developer journal about God of War implemented controller rumble, a video essay on what makes Yakuza unique, and a video exploring how life meters used to be conveyed through a “chicken-o-meter,” and how that evolved into the facial expressions on Doomguy. There are also a few non-gaming articles and videos as well, including why MCU action scenes are so much better than those from DC movies, the ideology of the First Order in Star Wars, and the right way to respond to negative feedback. And hey, there’s even an article about how to get into speedrunning by TAY’s very own Ben Bertoli! People always say that you should get your news from a variety of sources. While this is true for political news, I believe it’s also just as important about any topic you care about, including gaming, and this reading list helps tremendously with this. Granted, it’s all chosen by a single person, but it’s from a variety of sources and points of view. For just a few cents per article, I find the price well worth it. If you really don’t want to pay though, Mark also does something pretty unorthodox at the end of each of his videos: he leaves embedded links to not his own videos, but videos of others, even though he doesn’t have guests on his show. As awesome as Mark Brown’s content is, I think it’s even cooler how willing he is to show people the awesome stuff that other people make as well.